CD review: "Raffi's Christmas Album"
Raffi's 1983 Christmas album is now out on CD. If you have rug rats about this house, you undoubtedly know about Raffi, the bearded wonder who can entertain the tykes for hours on end. He's a one-man babysitting industry, with his CDs and videos of children's music. 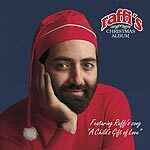 His approach is unchanged here, with favorites like "Rudolph the Red-Nosed Reindeer," "Frosty the Snowman" and "Jingle Bells" all performed with Raffi's inimitable ability to communicate directly to the little ones. If you do indeed have small children, this is the perfect CD to keep peace in the house whilst you and the spouse sneak off to wrap gifts or spike the eggnog.